Today’s episode features Steven Beck, one of the top Gallup StrengthsFinder experts. In fact, he trained Lisa back in the day! This interview focuses on the concepts of peak experience, how to use your Top 5 to bring out the best in others, and great information on how to make a practical connection between your core strengths and the values that are most important to you. Listen in…you’ll learn a lot today. 1. Learn what your peak experiences are. Steven talks about the yearning he had to really do something different, yet he wasn’t sure what that was. And he didn’t know where to start with a career change. After reading the book, Never Buy a Hat If Your Feet Are Cold: Taking Charge of Your Career and Your Life, by Ken Felderstein, Steven asked the author to meet for lunch so he could ask him questions. Ken asked Steven this key question: What are the peak moments you’ve had in your life? These moments will give you a glimpse of excellence, and should show you what you really yearn to do. Once Steven answered this question, and figured out what his peak experiences were (clues to natural talent), he knew he wanted to be a speaker. Over time, he kept pushing himself out of his comfort zone, until he became a strong speaker and trainer. This was the first step that led him to connect with the Gallup team and the Clifton StrengthsFinder tool. 2. Use your Top 5 to bring out the strengths in others. Steven uses himself as an example of how to use your own strengths to get projects done, while bringing out the best in others. He figured out that, for him, his Communication talent theme is really a story telling strength. His Woo strength is his ability to find common ground within a group, and his natural Maximizer talent is his ability to figure out how he can use a thing in many situations – an efficiency strength. This helps him to pull others’ stories out. It also creates his unique version of Woo, which helps him shape how a group interacts with each other. Then, once the group has been strengthened, his Activator strength kicks in, and stuff gets done. You can apply the same method to your own strengths, by figuring out how one strength affects the other, thereby bringing out the strengths in others. Red: Was the person devalued, disengaged? Neutral: Do I even remember what happened during the interaction? Green: Was the person more engaged, and left feeling valued? 5. Lighten someone else’s load for better teamwork and productivity. By this, we don’t mean to take on that person’s tasks, we mean to take away some of the emotional burden people feel toward their team members. When you listen to this interview, you’ll hear a great example of how one team went from wanting to kill each other, to a place of acceptance of each other. The team learned to come from a place of fascination about each individual person, instead of from a place of frustration. You can reach Steven through his website, Steven Beck Consulting, or via LinkedIn. Read this article on Gallup’s website, about how the Peak Moment Question changed Steven’s life. Lisa Cummings: You’re listening to Lead Through Strengths, where you’ll learn to apply to your greatest strengths at work. I’m your host, Lisa Cummings, and I gotta tell you, whether you are leading a team, or leading yourself, it’s hard to find something more energizing and productive than using your natural talents every day at work. And today, you’ll get some deep wisdom from the person who taught me a lot about strength space development. In fact, he’s the guy who led my certification program when I did the Gallup process to get certified as a StrengthsFinder performance coach, so he’s pretty ninja. And, besides being a genius at bringing out people’s natural talents, he’s a fellow music lover. We instantly connected over Tom Petty and CCR Tunes when we first met, and he’s also a fellow lover of dogs and eating tacos, so right there you know he has his priorities in the right place. So with that, Steven Beck, welcome to the show. Steven Beck: Hey, thanks a lot Lisa. Lisa Cummings: Yeah let’s do it. So you know that this show is all about exploring strengths. That’s right up your alley. And that one of your favorite first places to start with people in getting clues to talents, I guess of yours, or of other people’s, is that you love to ask people about peak experiences in their lives. So tell us a little bit about what led you to that question as your favorite. Steven Beck: I’d lead with questions to get to that peak moment. So let’s start with that. Earlier, many years ago, I won’t tell you how many years ago, I was just a little bit uncertain about my world. I was really drawn to human performance and speaking, and even though I was a little bit painfully shy I thought, “Gosh, what am I supposed to be when I grow up?” So I got on with Xerox and sold copiers and I just had this yearning, this gnawing feeling of, what do I really want to do? So I had this conversation with a friend of mine, and I said “motivational speaker. Steven Beck: I listened to tapes, but I didn’t even know what that meant. I just thought, well, travel, so I discounted it. Then I read a book and it was called, Never Buy A Hat If Your Feet Are Cold, crazy name. And, I contacted the author. I thought initially he was thinking I was creeping on him but I didn’t; I just was darn curious about what he was representing and talking about in the book, and so I contacted him and had lunch. He put me on a little project and it was a peak performance kind of project where he just asked me a series of questions about what I really love to do, what gives me energy, and my peak moments in life. Out of that, I started my journey towards moving into the field I’ve been in for the last 20 years. Lisa Cummings: That’s so cool. I mean first it’s funny because I think that we have a trend going because this is the second time right at the beginning of an interview in a row that we’ve had conversations about being creepy, so thanks for that fun as well. But now that we know you’re not a stalker. I love that that’s how you got started with this in such an unexpected way. So, will you share with us? Do you remember what your answer or answers were around your peak moments? Steven Beck: Yeah. One of my peak moments kind of crazy was about my brother when he got married. I think it must have been 20 – 25 years ago. He asked me to do the toast for his wedding. There’s about 200 people, of course different families, you know they’re out there. I’m not going to lie, I had a beer, or maybe two, beforehand. And so to do the toast I really didn’t know what I wanted to say, but I had great intention, and I love both, obviously, my brother and his bride to be. So I just started talking, I just started storytelling about both of them and I owe it to the audience. We had a lot of fun, a lot of laughter and everything. And then from that, I thought, gosh I want to do that again. Gallup calls it a glimpse of excellence. And so that was one of my peak moments that led to actually me being a facilitator and keynote speaker is I happened to buy it because I was drawn to it so I had some yearning I got put in a place to do it. And then after I executed it, I said to myself, “gosh, I don’t have too many more brothers, but when can I do that again?” So I went through this whole process and really started to push myself into those environments, so when I got my Master’s degree I found myself nervously presenting every week on our findings for the week. And I just kept pushing myself beyond my comfort zone. And that was just one of the big peak moments that led to what I’m doing, is just finding my voice, finding humor through it, engaging with people, and then all of a sudden it started to be my calling. And here I am. Lisa Cummings: It’s one of those stories when I hear it I just think, “oh yeah.” I mean I hear in your voice even all those years ago when you said the phrase, “I owned the room,” I know that everybody listening was like me where we could feel your face lighting up, we could see you being back in that moment. So now that you fast forward to what you know about yourself with the lens of the talent themes and the StrengthsFinder terminology behind it, tell us a little bit about what you were top talents are, and how now you can reflect back and see those coming out in that discovery. Steven Beck: Gosh, great question. Thank you. So my top five are Communication (surprise), Woo, Maximizer, Strategic, and Activator. And I got to tell you, I use those every day in everything I do, but especially when I’m presenting, you know the whole thing with communication is storytelling. I was just doing a program a couple of weeks ago with a friend of ours, Erin Passons, and we were talking about communication and storytelling. And then, she flips it over to me, and I start to tell a story, and she says, “Are you telling the story, again?” I said, “I guess I am.” I didn’t realize that I just go into storytelling. So it’s not something I do consciously. It just comes with a theme, and then I’m always just trying to get that common ground with my Woo with a group because I’ve got to establish credibility and connection really quick. So I just use humor to get there, and you know the Maximizer is what’s the perfect story or the strategic because how can I use this right now in this situation? And it’s just like tumblers in a lock; it just clicks in, and I just can’t wait to kind of share that next story, but then pull their stories out. I think just me being authentic about it…being human about my stories that half the time don’t make me look good. It pulls their stories out and then all of a sudden, the room changes. I just love that because then I’ve got something to work with. And then I go right into okay, what are we going to do with it? So my Activator kicks in. It’s like a stock car you know I’m breaking and speeding and hitting those turns and I just leverage the top five themes to help me get to that best performance every time out. Lisa Cummings: You do. Yeah I’ve seen it in action and I love how you phrased that where you’re doing it in a way that allows other people to bring their stories out as well that happened so masterfully when they see you at work. And also want to take that opportunity to give Erin Passons a shout out. She is one of our fabulous colleagues out there in the strings world and is just amazing at this as well. It’s just so cool to talk about how it even looks when you know each other really well, and how you can call each other’s gifts out because you know they’re coming, and you know they’re speaking right through your talents. Steven Beck: You know I got to tell you one other thing I just happened to think about, Tuesday when I was doing my program so I’m just I just started I’m 10 minutes into it Lisa, and I’ve got a PowerPoint on the screen in a big room, and they were trying to get a mike set up and I’ve got my voice on all the time. But there’s a guy in the back and he shuts down the screen and the projector while I’m talking and if I didn’t have that Woo and Communication with my Adaptability about laughs, I would have freaked out, but I just go “okay I guess that’s it; that wraps the show,” and then everybody laughed and then they kind of gave me permission to stumble a little bit and come back in. So I wouldn’t set up myself for that ever again, but I think part of it is that that confident vulnerability where stuff happens. You do whatever you do and people are more endeared to you because you show your human side. That’s what I love about strengths. Lisa Cummings: I think so too. And you know that confident vulnerability that great phrase you just said also made me think about how beautifully you do that, I believe, because you live through your values so clearly. So one thing I’d also like to ask you to talk to people about today is, you know, what does that look like? So many of us have done some exercise during our careers, whether we did it for ourselves, or someone else facilitated it, where you pick out your values, you have a list of them, you’re trying to get in tune with them and that’s great. But a lot of times that’s kind of it. They forget about them, and they haven’t thought about it for a while and don’t make it a practice or make it part of their day. So how do you make a practical connection with strengths and values to daily life? Steven Beck: I got this values card sort, you know from from Gallup, and I have people go through it. And part of the thing with values I always say when I’m doing this exercise. Now we all have values and they’re all good. And you don’t have to pick the right values for everybody else to agree with, but pick the ones that are the most important for you. That gives people permission to not say integrity or honesty, but to get to their core. So I’ll just share my values: passion, family, health, autonomy, and emotional well being. And what I find is, that guided me into going on my own, or Steven Beck Consulting, it guides me in the kind of work I choose to do and the clients that I’d choose to work with, because these have to be fed. So I think part of it is you’ve got to just take it and own it what you choose. And then I actually in my man cave I have my little desk with my clear protector. But I’ve got him right in front of me. So when I’m asked to work with a client or I’m thinking about a project, or I’m creating a presentation, I look through those, and I just kind of do a check in, is that feeding those values? Are they in alignment? So I just find that values is a core driver. Curt Liesveld, late, great, strong colleague of mine. His latest research before he passed was around values because he saw it as the cornerstone to strengths because you live out your strengths through the foundation of your values. His work around that has really made me a catalyst to bringing values in my strengths workshops and the work that I do because it sounds personal initially but it’s very core to making strengths come alive. Lisa Cummings: Here’s a tweet people have ever heard when you live out your strengths through the foundation of your values and what a practical layer that you added to where you have them on your desk and you check in with them regularly they’re in front of you and you see them and you use them as almost a vetting technique to see if you’re aligned with them. Okay here’s a real practical one. You’ve got us imagining your man cave, and you said clear plastic protector argued you say plastic is a clear protector and instantly I started thinking of a pocket protector and I and then I thought no no no no this must be like a piece of glass over the desk. So that was the vision of your man cave here. Steven Beck: Glass over the desk Plexiglas. You’re going to love this. Under that is my five values right? Right next to that is a postcard that my daughter lived in Austin. She knows I love Austin (Steven lives in Orange County, California, which is outside of Los Angeles – and a long way from Texas). She gave me a postcard with one of these kind of food trailer places, you know, where you get your breakfast tacos. And so I have that because that anchors me into all the good times. I’ve got my Christmas picture from last year where I can look at my family so that’s kind of my priority and Austin brought me so much well-being, but enough of that. I’ve got Curt Liesveld’s memorial card. He said, “learn, love, and live core strengths.” So it anchors me to keep him alive. I’ve got a picture of a big rock, somebody is jumping off of, and I kind of look at that as my jumping off the safe Gallup world to start my own business. And then I’ve got a little thing for Mardi Gras. I’ve got a rock concert picture and that’s you know when you talk about leadership pictures you know everybody in a rock concert and the electric energy. I try to bring that, Lisa. Everything I do is inspire and electrify conversation and people so they leave with an experience. And then I’ve got I’ve got just other stuff. I think you can tell it’s a pretty loaded deal here. That’s my world in a Mardi Gras coaster. You’ve got to have a Mardi Gras coaster. Lisa Cummings: You have to in a man cave. So this is really rich. I love it because I am just checking in, you know, tell us about your man cave and we get this beautiful view into something anybody listening could even take away when they get to know you 1) it’s pretty fun to see you had going on there and then 2) they can think about how could they put their stuff in front of them, their values, the things they want to check in with; the notions of what’s most important to them and those things that you do to signal yourself to stay where you want to be and keep becoming the person you want to become. I love it so much. Steven Beck: Hey listen, I’ve got to tell you when you said put your stuff there, like my wife thinks I have too many chachkes and stuff right? But there are certain people that like to bring stuff into their surroundings so it anchors them, so you’re in the right space when you’re on the phone or in your work. And so I surround myself, to your point, with my stuff so that I’m feeling good and it’s not work. I’m just expressing what’s important to me through my work. So thank you. That is a good question. Appreciate that. Lisa Cummings: That’s cool. And I do the same I just do it differently I’m kind of minimalist non chachke person but I do it digitally so I have some criteria for a hell yes year so that I can really keep my mind focused on the life I want to build. And even though it’s a digital look, it’s still the same, it’s getting centered on where you want to go, and who you are and what puts you at your best so different ways to get there. And for those listening, Steven and I have remarkably similar top 10 top 13 kind of talents, so even though you might look at those on paper and think oh it looks like the same person. Not at all. And so even though we have a lot of similarities, we also go about things a little bit differently. Lisa Cummings: So going about things differently just instantly makes me think of Individualization as one of our talents and also makes me think about people managers and how important it is to individualize their style to their team members. I’ll tell you what, in working with people managers I find they get pretty fired up at StrengthsFinder training events, and then they find it easy to lose steam after the weeks pass. So I’d love to hear from you. You’ve worked with so many of them. What are some things that you’ve seen or you’ve done to really help them embed a Strengths-based culture in their workplace? Steven Beck: One thing that I like to teach and have people think about is Danny Kahneman’s work around measuring how many moments we have. There are 20,000 moments a day, and they come in three-second windows, whether it’s a thought, a gesture, a stride. These are moments and with those three-second interaction, what are you doing each and every time, as a result of them engaging with you for just a few seconds? Would they hit the red button that says they feel devalued, less than, disengaged? Would they hit the neutral button, the question mark? I don’t you remember what the conversation was about, or would they hit the green button, which is they feel more than, they feel more engaged, they feel stronger? And so I would say, “how did you treat them? How would they rate you every conversation?” So if you go back to Don Clifton’s whole research about imagining what would happen if we focused on what’s right with people versus fixating on what’s wrong with them. If managers just kind of shed the light every conversation they’re going to look for the good, they’re going to lead with positive intent, which is really one of the core values of strengths. How you think about other people will affect your involvement and interaction. If your thoughts and feelings are primarily positive then your involvement and interaction will be primarily positive in nature. You’re listening as you’re coming into a conversation. Are you fully present? Are you practicing mindfulness? Are you really there for people? I think that’s the crux of Strengths is really driving to your exchanges and then try to put yourself in their world versus you filtering through your world. Lisa Cummings: It is. So many good ones in there. You had the quotable of imagining what would happen if we focused on what’s right about people. You have this piece that I hear almost no one talking about this subtext that what if you really shifted your mindset and you were focused on them and the value they’re bringing. That’s such a unique layer to mindfulness, we don’t hear about often. And then the practical. You know when you were describing the red button the green button and the question mark, instantly it made me connect it to what is you’re seeing in airports and especially airport restrooms around the world now where they have like the happy face and the sad face and you walk out. Did you leave feeling good or bad about the experience and if you kept that in mind as a manager now. What tone did I just set? Did I just leave him feeling better about today or worse about today? Do they get the happy face button or do they get the sad face button when they leave their exchange with me? What a beautiful way to imagine that with each interaction. Steven Beck: If you’re really in it, in the moment, you can create their experience. I strive for emotional experiences in every exchange so that when people have met you, engaged with you, had a quick conversation, they’ve got a little pop, they’ve got a little bit of energy. They’re not more drained, they’re more energized, and that’s kind of how you lighten people’s load and that’s how I live my values is to lighten their load through humor and make them feel good about themselves. Lisa Cummings: Now it comes out so apparently when someone watches you facilitate how you drive for that experience and that depth and while spending a course of days with you, I saw some major transformations take place because you set the stage for people to be able to do that. So I know that you’ve seen some big transformations with your clients with StrengthsFinder that what things have happened on teams you’ve worked with, so I’d love to give listeners a view of just what’s possible when they really put their natural talents to work. Can you tell us about maybe one transformation that you’ve seen where let’s say there was a dysfunctional team to begin, and then came out on the other side looking different? Steven Beck: All right so this one really stands out. It was a major university. I won’t say which one; it was the music department. And the bottom line is I was brought in kind of almost as a mediation person. It wasn’t even oh Steve, go talk about strength and feel good about themselves. These people want to kill each other. So what I did is I just established trust with who I was, and that by telling my stories, and by connecting with them and giving some context. Slowly but surely individually they came up and they started to share their stories. I worked with them over a month and I did a program on communication for two hours. I did a program on conflict management, but at the end of the day I think they started to see themselves as human beings that are not perfect, that are well-intended, and that we probably need to get a reset on some things and then it’s also some languaging. One thing I instituted with them is rather than point fingers just say something along the lines of, “here’s my experience with this event…” and just start to share when it started to become very off the sidelines and more authentic when they got permission to be themselves. And I did a little element of strengths, but the big transformation happened when I showed my cards. I provided a safe venue for them and I did more than mediate. I think I brought them to a place of acceptance of each other. I figured something that’s been festering for years and bringing them together in a period of a month, that’s my big win ticket. Lisa Cummings: Now what a great accomplishment. I can just imagine that transformation is continuing to happen. But that that was a totally different way for them. 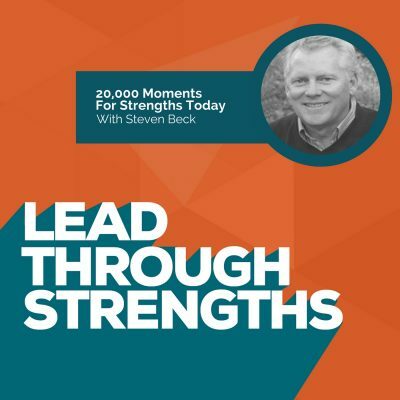 Steven Beck: One thing I always say around strengths, when you’re rubbing up against somebody else’s talents that don’t resonate with you or push resistance. I always say come from a place of fascination versus frustration, so replace frustration with the word fascination and then truly lean into that. I’m fascinated how different we are. I’m fascinated why you do it this way and I would do it that way. And just flipping a couple of words in your brain changes it. And then all of a sudden from a Strengths perspective I’m fascinated how different we are. Lisa Cummings: And it just kind of brings the wanderlust and the sincerity that says, “aw man, help me understand this. This is so cool.” Then you start to see oh boy that perspective actually helps the outcomes at work, and just because people don’t do it like I do it doesn’t mean it can’t be better. Both of our perspectives are brought into the fold. Lisa Cummings: Exactly what a great way to pull it all together so aw man Stephen this has been a real treat, and I know the listeners want to find more about you and your consulting practice so where can they dig into your work a little bit more? Steven Beck: I’m at StevenBeckConsulting.com. And then if you want to reach out to me and find me on LinkedIn, it’s just LinkedIn.com/in/StevenJBeck. Gosh I’d be excited to hear from some of the folks and continue the conversation. Thanks so much Lisa. Lisa Cummings: Wonderful. And thank you for joining us and for everyone listening we will link to those in the show notes both that website, that LinkedIn profile, and also a really great article that ties back to our first conversation on peak performance. Steven did an article for Gallup that tells a deeper view of the story we talked about today, and as just a beautiful one to give you more perspective on that question and that concept of peak experiences. So thank you everyone for listening to Lead Through Strengths. Lisa Cummings: So with that remember using your strengths makes you a stronger performer at work. If you’re putting a lopsided focus on fixing your weaknesses, you’re choosing the path of most resistance. Instead, claim your talents and share them with the world.